After our wonderful time in New Zealand we had a week to recover before I was off again. In the three weeks we were away new tenants had moved in and I spent a lot of the week tidying up after the mice and making the house habitable. Hopefully we’re starting to win the fight! My body struggled with the difference between a sunny Auckland in the middle of Summer and a very cold wintry London and a combination of jetlag and a cold meant that my play at the 4ncl left a lot to be desired. My two draws were the absolute most I could hope for. The team were actually very fortunate to squeeze past Barbican 2. We only managed 4.5 points after Simon Knott forfeited his board due to a family emergency. Not great preparation for Gibraltar but at least I felt much better on the Monday. A three hour delay due to a problem with the plane’s hydraulics at Heathrow meant I had to rush to get to the Opening Ceremony but finally managed it. This year I shared an apartment near Ocean Village with two Swedish GMs: Erik Blomqvist and Nils Grandelius. I actually played Erik last year, a hard fought draw in round three before both our tournaments completely collapsed, we were hoping for more this year. The first round I was Black against Spanish junior Alejandro Perez Garcia. While preparing I thought he only played the English but surprised me with 1.d4. After a think I decided to play 1…g6 and we transposed to an Austrian Attack against the Pirc, the most theoretical option. He didn’t know the intricacies and I had a clear advantage straight out of the opening. I drifted and he put up stiff resistance and in the end I had to grind out a drawn rook and pawn ending. Celebrations in the flat that night, as Erik defeated the very strong Chinese GM Li Chao. At 2751 this was the highest rated player a Swede had ever beaten. As it transpired this was the only day the flat made 3/3, Nils having dropped a draw in round one. So not a very convincing start but at least I’d made it to 2/2. Last year was actually very similar but then things went horribly wrong. I was determined not to repeat the pattern. The next round I was Black against Zhongyi Tan, a WGM from China and currently ranked 14 in the World on the Women’s list. The only reason she was not yet at least an IM was not playing many tournaments abroad. In fact I believe she got a GM norm from the tournament. I was Black in a Fianchetto King’s Indian and decided to get creative, sacrificing first a pawn, and then the exchange for the light squares and some attacking chances. Zhongyi Tan gave back some material and we were left in a middlegame where I had queen, rook, two bishops and five pawns against queen, two rooks, knight and four pawns. A nominal material disadvantage but the bishop pair are very powerful and I had very good winning chances. She gave a pawn to exchange queens but then I erred, allowed her to activate her pieces, and had to be content with a draw. Brian was adamant that Gibraltar would be different from the usual male-dominated chess scene by offering very attractive women’s prizes. The top woman wins £15,000 as well as any main prize she might pick up. Therefore it’s not surprising that I played another strong woman in round four, the Georgian GM Bela Khotenashvili. I chose 1.e4 and she blitzed out a long line in the Caro-Kann. We reached a position where I had bishop versus knight in a queen and rook ending with each player still having seven pawns. Objectively I didn’t have any advantage but just before the time trouble she made a mistake and we swapped into a queen and pawn ending where I had an extra pawn. I found a trick and managed to exchange into a winning king and pawn ending. Round Five and Nils and I had managed to climb into the chasing pack. Both of us were given double White, me against the Polish elite-GM Radoslaw Wojtaszek and him against Maxime Vachier-Lagrave (or MVL as he’s known). Nils’ game flowered into tactics just out of the opening but both played correctly and it quickly went into a drawn ending. Radoslaw surprised me with his opening choice and we transposed to a Samisch Nimzo Indian type of position. It was an interesting strategic battle where I managed to break in the centre with the classic e4 break but Black gets good counterplay on the queenside and against my pretty terrible dark-squared bishop. In the end we went into an equal rook and knight ending and agreed a draw. That game happily broke my drought. I hadn’t played anyone over 2700 since Isle of Man 2014! Round Six and Black against the current number seven, MVL. I played 1…e5 in answer to 1.e4. He played a sharp line and I spent a lot of time trying to recall my analysis. I survived being mated but went into an unpleasant ending where he has the bishop pair. He showed why he’s one of the best in the world and ground me down. Still I felt I hadn’t disgraced myself and was enjoying playing against the elite again. Round Seven was a return to the top female players. I had White against Aleksandra Goryachkina, rated 2502 and the top girl (U20) in the world. I noticed while preparing that she was deadly with the initiative and so played the English to try and bore her. It seemed to work and she drifted. I couldn’t resist going for a kingside attack and gave a rook to open a path to her king. Round Eight I was up against another strong woman, Irina Krush from the USA. Irina beat me last time we played in Gausdal 2007, a tournament won by a certain Magnus Carlsen. I surprised her with the Nimzo and had a pleasant position out of the opening. I saw a tactic that I thought won material but missed something at the end and only went into a better ending. Irina defended well and I almost over-pressed but the draw was a fair result. By this point I knew I probably needed 2/2 for a good prize. Round Nine I again played someone I had previously, Luca Shytaj from Italy. We played back in the World U18s in 2004, I triumphing in a long rook and pawn ending. Unbeknown to me it was Luca’s 30th birthday and, as I discovered when checking the wall chart during the game, needed to beat me for a GM norm. Probably because of this he declined an exchange of queens into an equal endgame. I managed to pin him down and broke through just before the time control. When we got back to the flat I discovered I had the dubious pleasure of Black against Yu Yangyi in the final round. Of course I want to play as many of the elite GMs as possible but this certainly wasn’t the easiest last round game. Rated 2744, Yu Yangyi won the 2014 Qatar Masters, defeating Vladimir Kramnik in the last round, and tied for first in 2015, that time defeating Wesley So; he seemed to thrive in the last round of big opens. I decided to take him on in my pet Dragon and was very surprised when he had a long think in a position I’d had a few times before, and where the theory is really just starting. He chose an innocuous line and the queens were quickly exchanged. He missed something and I managed to win a pawn but it went into an opposite coloured bishop ending that really should have been drawn. However, he missed something, and I managed the best scalp of my career. Photo taken by John Saunders before the round started. As always the Tradewise Gibraltar Festival was very well run and deserves its place among the top opens in the world. Not only does the tournament boast impressive prizes and an extremely strong field, but there are as many side activities as a chess tourist could want: from Simon Williams and Elisabeth Paehtz’s entertaining commentary to the evening blitz events, and this year Brian and Stuart scored a major coup with Masterclasses including from former World Champion Vishy Anand and MVL. Those can be seen here . Continuing from last year, Tania Sachdev also hosted ‘The Day’s Play‘, a video round-up of the day’s events. You can watch all those at . 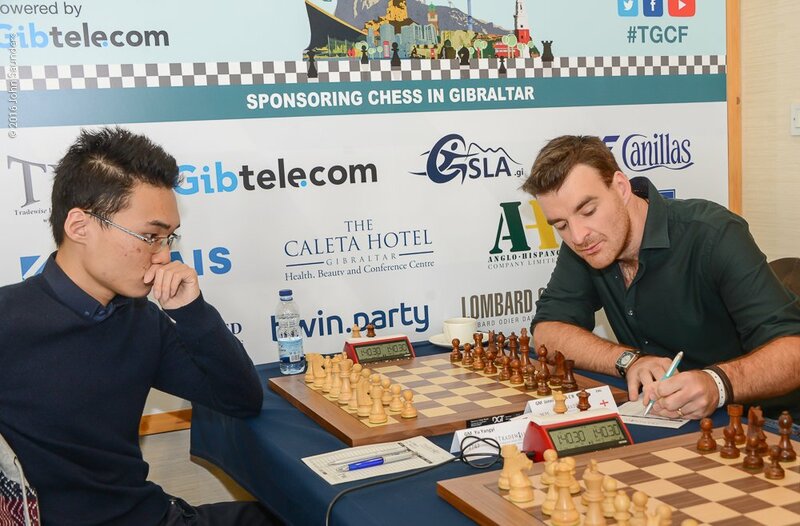 Other tournaments should take note of how Gibraltar has become so successful if we’re to turn chess into a mainstream activity. Relaxing at the Closing Ceremony with Erik, Nils and Molton (who got his second GM norm with a victory over Naiditsch in round 9). 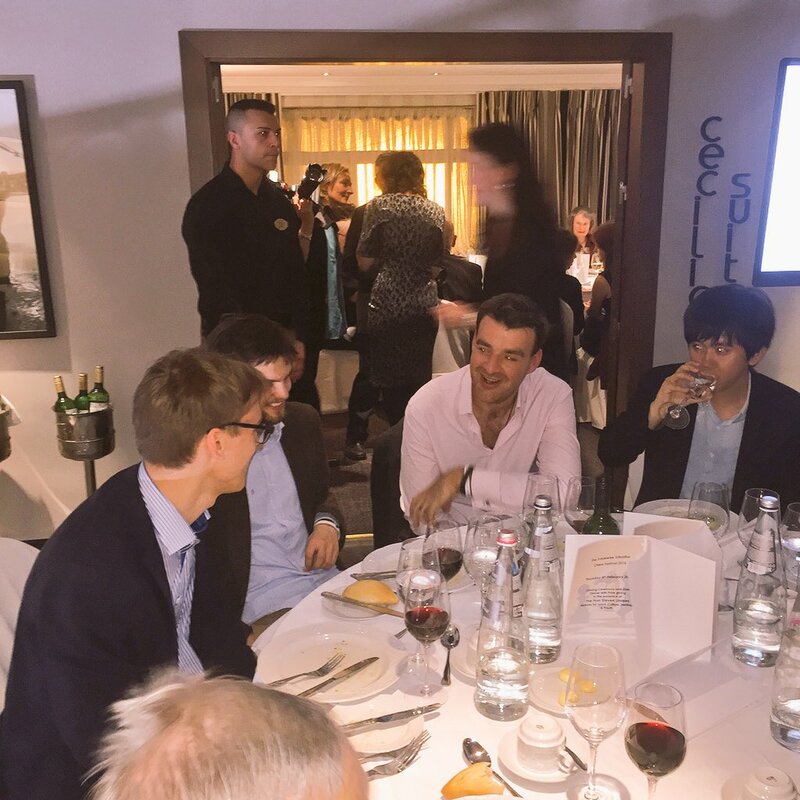 Photo from TradeWise Chess on Twitter.